Sand Springs (6-2) emptied the bench on the Green Country Defenders (14-7) home-school team Friday night. Junior Sydney Pennington led the scoring effort, shooting 7-of-8 on field goals and adding a free throw for a team-leading 15 points. Freshman Holly Kersgieter also doubled with 10 points. The Sandites got off to their biggest first quarter lead of the year, scoring the first four baskets of the night before the Defenders finally got on the board with a two pointer from Melanie Williams. Within the first moments of the game, Pennington scored a layup off a steal that she made look far too easy, then scored the next basket on what looked to be an instant replay. Pennington would finish the night with six steals. The Lady Sandites turned that 9-2 lead into 24-6 by the end of the first period and started to run the roster in the second. The second quarter was a lot closer, but the home team still maintained a commanding 32-11 half-time lead. One of the biggest problems of the night was accuracy. The Sandites only made 43% of field goal attempts and 50% of free throws. When you take Pennington's 7-of-8 out of that, however, the girls only connected 34% of the time. 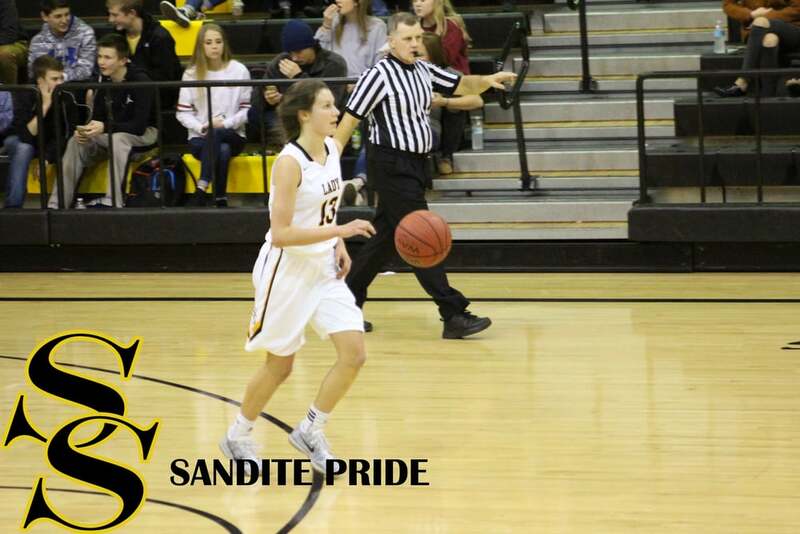 It's not uncommon for a team to play less than their best against lesser competition, however, and the Lady Sandites' performance was still more than enough to tie their highest-scoring first half of the season. The starters returned to action in the third quarter and once more Pennington scored back-to-back layups to kick things off for the home team. Ashley Duncan was next in on the action, sinking a pair of free throws for the Defenders. Duncan led her team with 13 points, shooting 5-for-6 from the charity stripe. The Defenders managed to match the Sandites' meager 8-point fourth-quarter, but unlike the first time the two teams met this season, the Defenders failed to lead the Sandites' in a single quarter and ultimately fell to the Sandites for the second time this season. 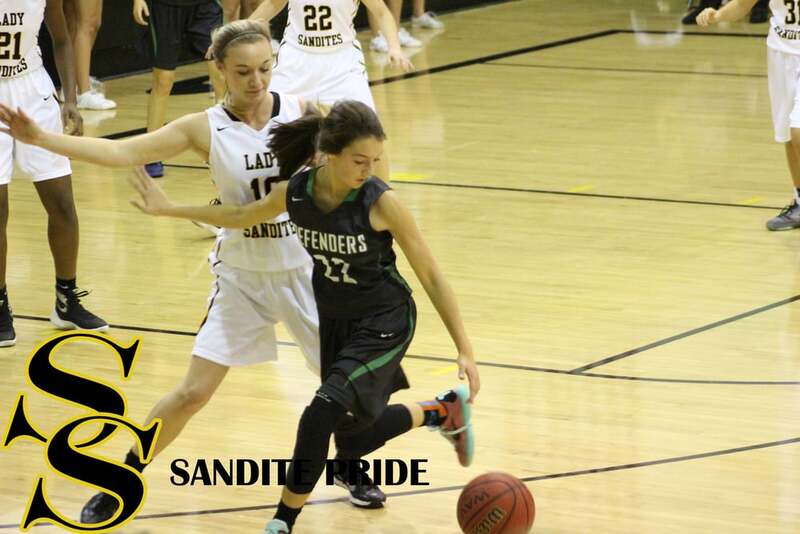 In the season-opener the Lady Sandites registered a 59-39 win over the Defenders. 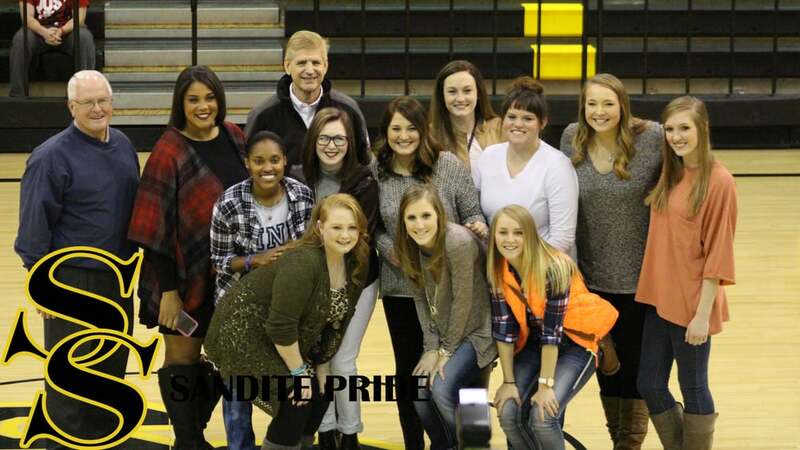 Friday's game marked the Sandites' fourth 20+ point win and biggest point-differential of the season. The girls will return to action Tuesday night at #9 Owasso (9-2). The JV girls won 33-28 bringing their season record to 3-1. 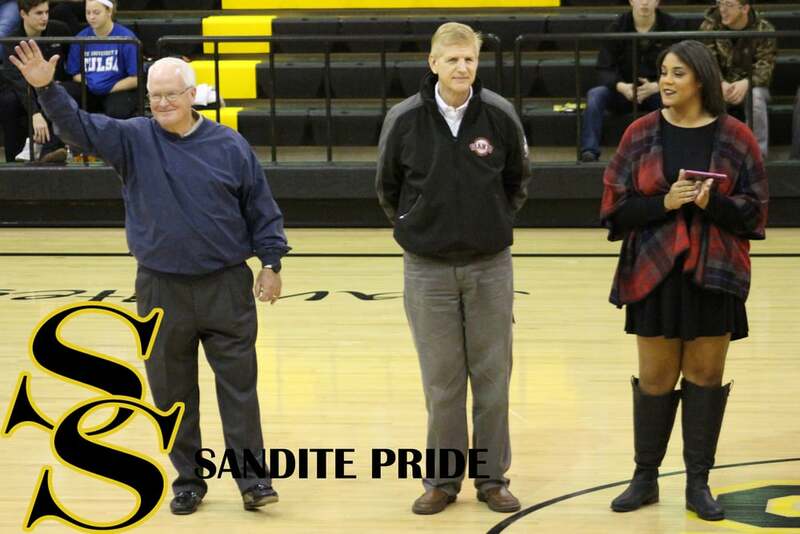 At half-time, the school recognized the accomplishments of the 2010-2011 Lady Sandites who were coached by Bob Banfield and won a Regional Championship.